Set in the heart of the Cardamom hills of Kerala, Spice Village is an unprecedented tourist destination, offering a rare opportunity to enjoy South India's wildlife & Beauty. The Village lies just outside Periyar tiger reserve, and a stay here is the perfect way to appreciate and respect the environment. Recreating the mood of local tribal community, the resort architects have designed individual cottages amongst a landscaped spice garden. 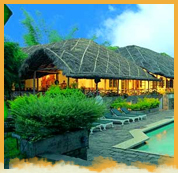 Each dwelling is thatched with elephant grass & offers simple luxury & privacy. Boat Rides at Periyar Tiger Reserve, Forest Treks, Ayurveda & Rejuvenation, Visit to Spice Plantations. Water Safari, Forest Treks, Visit to Spice Plantations.